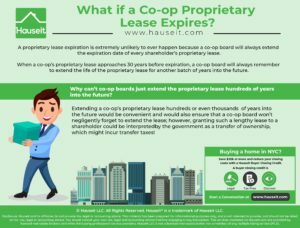 Proprietary Lease Expiration - What if a Co-op Proprietary Lease Expires? Is a co-op proprietary lease expiration possible in NYC? What happens when a NYC co-op apartment’s proprietary lease nears expiration? Have you ever wondered why your co-op board doesn’t just extend the expiration date of every shareholder’s proprietary lease hundreds of years into the future? A proprietary lease expiration is extremely unlikely to ever happen because a co-op board will always extend the expiration date of every shareholder’s proprietary lease. When a co-op’s proprietary lease approaches 30 years before expiration, a co-op board will always remember to extend the life of the proprietary lease for another batch of years into the future. 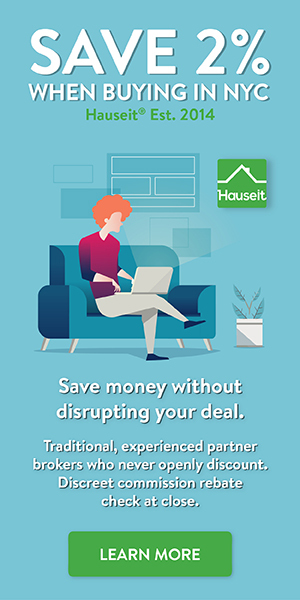 They will do this because most bank lenders will not agree to finance a co-op apartment purchase if the tenor of their loan is longer than the remaining life of the proprietary lease. As a result, a co-op board’s duty will be to always make sure the proprietary lease has at least 30 years left of life so as to not hinder the ability of shareholders to refinance their loans and for new buyers to secure financing. Every shareholder shares the same, most updated version of the co-op’s proprietary lease. This is the case even if the shareholder’s original proprietary lease received at purchase is now outdated. The latest version of the co-op’s proprietary lease applies to every single shareholder. As a result, it is not possible for a co-op board to somehow single out a shareholder and punish them by having only their proprietary lease expire. Why can't co-op boards just extend the proprietary lease hundreds of years into the future? Extending a co-op’s proprietary lease hundreds or even thousands of years into the future would be convenient and would also ensure that a co-op board won’t negligently forget to extend the lease; however, granting such a lengthy lease to a shareholder could be interpreted by the government as a transfer of ownership. If the government suspects that a transfer of ownership has in fact occurred, the co-op could be liable for paying NYC and New York State transfer taxes! This is precisely why co-op boards will always try to keep the minimum life of their proprietary leases at 30 years but won’t extend it too much longer than that. PROPRIETARY LEASE, made as of December, 31 1981 by and between [COOPERATIVE CORPORATION] with offices at [ADDRESS], New York, New York, hereinafter called the Lessor, and [SHAREHOLDER NAME] residing at [ADDRESS] hereinafter called the Lessee. The Lessor is the owner of the land and building erected thereon in the Borough of Manhattan, City of New York, known by the street number [ADDRESS] (the “Building“). The Lessee is the owner of [NUMBER] shares of the Lessor to which this Lease is appurtenant and which have been allocated to apartment [NUMBER] in the Building. The Lessor acquired the Building pursuant to an Offering Plan dated [DATE] (the “Plan“). NOW THEREFORE, in consideration of the premises, the Lessor hereby leases to the Lessee, and the Lessee hires from the Lessor, subject to the terms and conditions hereof the above mentioned unit in the Building (hereinafter referred to as “the leased space“) for a term from [DATE], until December 31, 2030, unless sooner terminated as hereinafter provided. As used here, in “the leased space” designated by the above stated number, means the area and rooms in the Building as partitioned on the date of execution of this Lease together with their appurtenances and fixtures, and any closets, gardens, terraces, or portions thereof outside of said partitioned rooms which, subject to the provisions of Paragraph 7 hereof are or is allocated by the Board of Directors of the Lessor (hereinafter called the “Directors“) to the exelusive use of the occupant of the leased space. The leased Space of the penthouse apartments include the portions of the roof adjacent thereto. (a) The rent (sometimes called “maintenance”) payable by the Lessee for each year, or portion of a year, during the term shall equal that proportion of the Lessor’s cash requirements for such year, or portion of a year, which the number of shares of the Lessor allocated to the apartment bears to the total number of shares of the Lessor issued and outstanding on the date of the determination of the total cash requirements of the Lessor. Such maintenance shall be payable in equal monthly installments, in advance on the first day of each month, unless the directors at the time of their determination of the cash requirements shall otherwise direct. The Lessee shall also pay such additional rent as may be provided for herein when due. As you can see from the sample co-op proprietary lease above, there are only 13 years left until expiration as of this writing in 2017. The original proprietary lease was dated as of 1981 and thus had a 49 year term. It is time for shareholders and the co-op’s attorney to remind the board of this co-op to renew their proprietary lease!